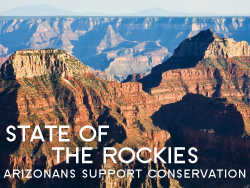 2015 Poll Results: Arizonans Support Conservation! A recent "Conservation in the West" poll found that 95% of Arizona voters visited public lands at least once in the last year. 83% viewed "Protecting and conserving natural areas for future generations" as very important, while 75% thought "Protecting and conserving wildlife habitat" was very important. And nearly three-quarters support protecting the Greater Grand Canyon region as a national monument!